January is now a memory and I have ambivalent feelings about seeing it go. I've never been one to wish for time to pass away quickly, but this winter has made me hide myself away seeking little creature comforts. 2015 was a season of vulnerability and change for me. There were sweet highs - like new babies being born into the family and the release of my new book - and some painful lows, some loss. I'd hoped January would feel like a fresh start, but I'm tempted to say it was for the birds! Okay, on second thought it's not been all bad. We did have some pretty snowfall and this cake. It is with this general sentiment that I've decided to cheat on winter. It's already springtime in my head. We're still months away from any meaningful blooms in the garden, so I decided to make my own. Plus, Valentine's Day is on the horizon and how lovely would it be to receive a dozen rose cupcakes? And of the double chocolate sort?! Lately I've been studying up on sugar paste flowers and practicing new techniques. 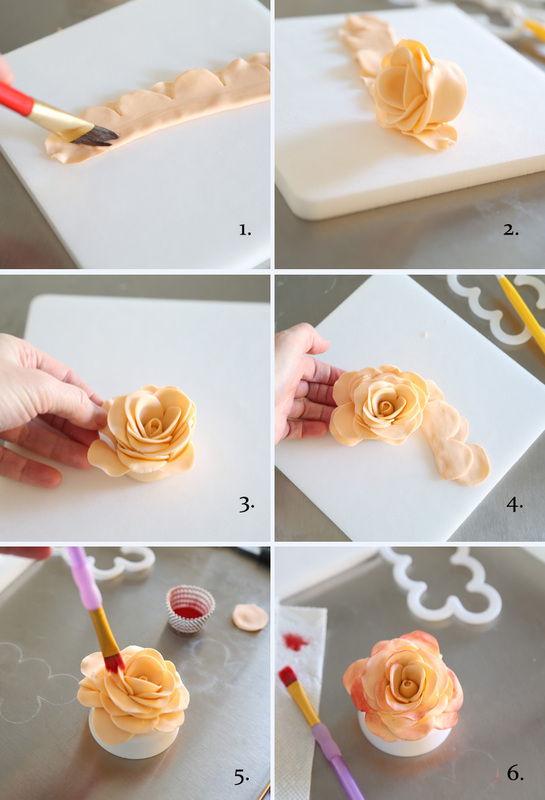 I recently found a gizmo that makes the task of making sugar paste roses much easier than building them petal-by-petal. 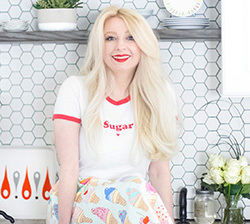 I can't wait to show you how, but first I thought I'd use this as an opportunity to show you my favorite tools and products to get started in the realm of sugar flower design. An equal mixture of gum paste and fondant is ideal for flower making. It creates petals that are flexible enough to manipulate but still maintains enough heft to keep their shape. I love using Satin Ice brand for its marshmallowy flavor, and I also love its container that seals airtight. Gum paste dries quickly, and the paste in reseal-able pouches never lasts as long as it does in these containers with snapping lids. Hands - so obvious, but the important thing I have to say is this: short fingernails and no jewelry. I know this is bound to be an unpopular suggestion, but if you want perfectly perfect flowers, then heed this advice. I follow this rule for all fondant applications (especially covering cakes). It's just so easy to stick a fingernail in a perfectly smooth petal, or slide a palm over smooth fondant and have your wedding ring pock the surface. Foam pads are essential for shaping petals. They're inexpensive and reusable. I suggest getting two kinds of pads - a plain pad and one with holes in it (like this set). The one with holes is used to make the receptacle parts on small flowers. Practiced flower-makers call these 'Mexican hats' because the end result is sombrero-shaped flowers. It's not something we'll use for this project, but it's a good thing to have if you plan to further your flower-making skills. There are many (many!) different fondant-making tools, but two of the essentials are a plastic rolling pin and a ball tool for shaping petals. (Wooden rolling pins are not recommended because they sometimes leave woodgrain impressions in the fondant). These tools are usually sold in sets, and can sometimes be expensive. I own several name brand sets, but recently I found this 46 piece set (and purchased it for around $13) that has almost everything a beginner would need - flower cutters, a smoother, a rolling pin, all kinds of fondant shaping tools and leaf cutters. Artists' brushes in a variety of sizes will be a great help to you while assembling and finishing sugar flowers. I suggest picking up a cheap variety pack at the craft store (or here). Also, petal dust is something that adds realistic color and dimension to flowers. I used red and green for the peachy-pink cupcake roses. 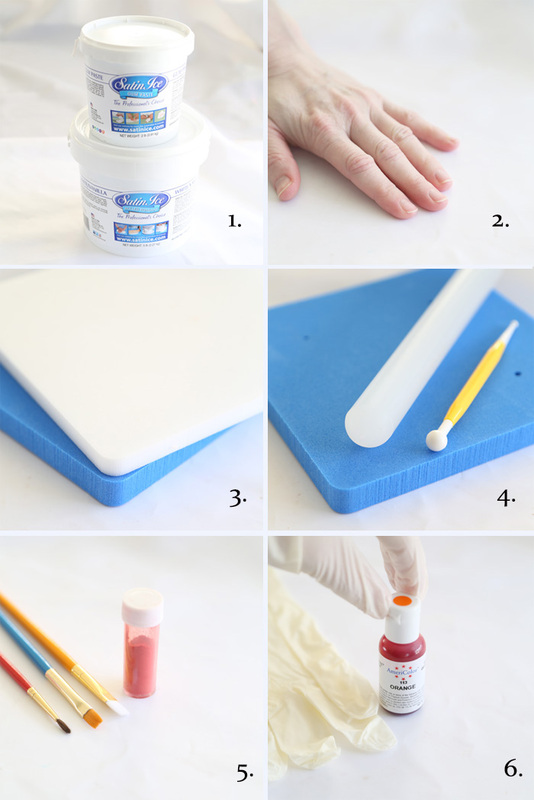 Gel food color is recommended for tinting the fondant and gum paste mixture. Always gel, and almost never liquid food color. I use Americolor brand for flowers-making. Too much liquid incorporated into the fondant/paste mixture can make it too sticky. Adding confectioners' sugar to make it un-sticky can completely change the texture of the paste and the petals will not ruffle just so. Another favorite is latex exam gloves. They will protect your hands from being stained while kneading gel food color into the paste. 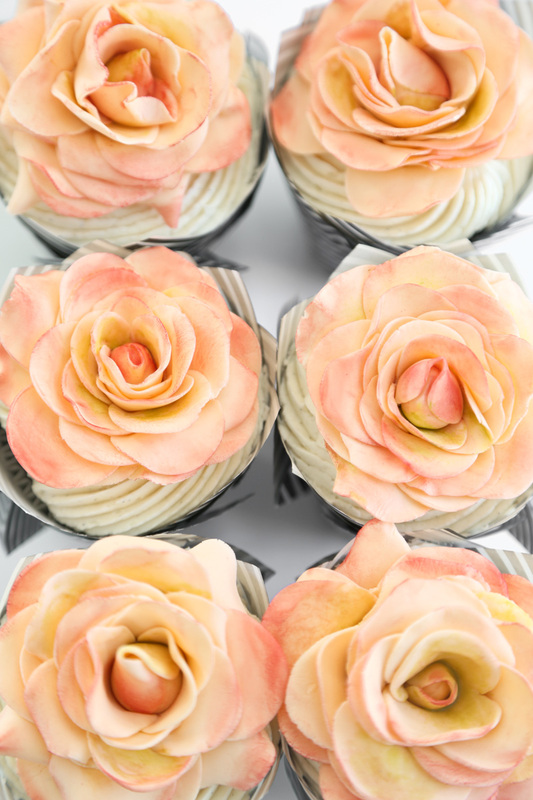 To make 12 of the peachy-pink roses, you'll need 8 ounces of gum paste and 8 ounces of fondant - both in white vanilla. Knead the two together well and add just 1 drop of orange gel food color. If the mixture feels sticky while kneading in the color, then knead in a small amount (start with 1/2 teaspoon) white vegetable shortening - again, no confectioners' sugar! It will make your petal edges feather and become jagged. Place the paste in a zip-top bag with the air removed. To begin making a rose, shape a piece of fondant into a cone about 1-inch tall. Here's the trick! 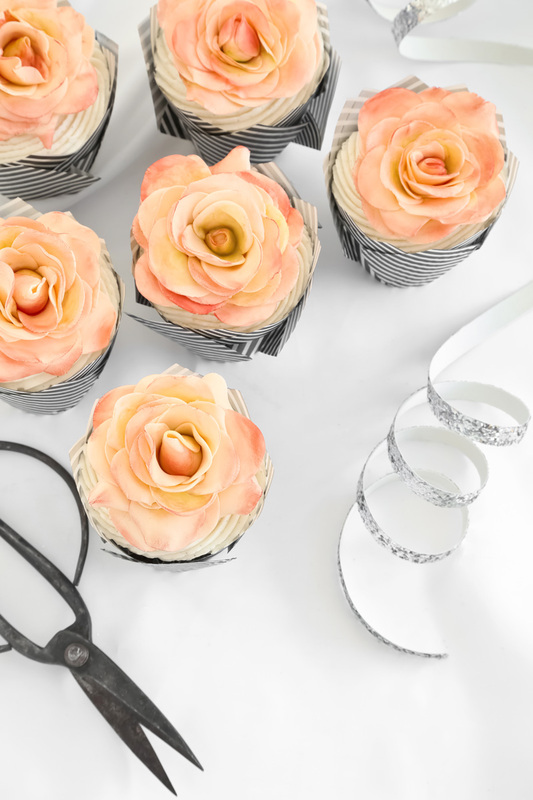 This Easiest Rose Cutter Ever fondant cutter makes fancy cabbage roses a snap! (Nobody's paying me to say that - I discovered this on my own accord.) First, roll the paste out to 1/8-inch thickness, and cut three pieces using the cutter. Cover the pieces with plastic wrap (re-roll scraps and place them in a zip-top bag). Place one of the fondant pieces on a foam pad and gently run the ball tool around the edges of each half circle. Use gentle pressure - you'll begin to see the petals ruffle slightly. Press the ball tool in the center of each 'petal' and using a circular motion to thin the centers a little. Use an artists' brush dipped in water to moisten the center of the shape; just run the brush down the center lengthwise. Fold the piece over so that the petals are staggered, and then moisten the bottom edge of the piece. Moisten the cone shape (from the previous photo set #2) with a little water using the artists' brush. Roll the frilled petals fondant piece around the cone. When you have applied two frilled pieces, turn the flower upright and gently separate the petals. With the rose upright, wind the final piece around it. 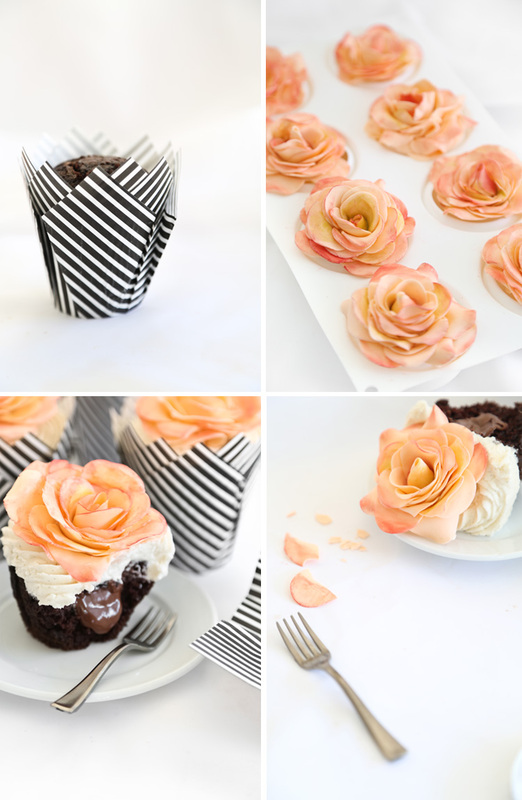 Place the rose in a flower shaping cup, or if you don't have one, place it in a cupcake liner. This holds the petals up just slightly so they fan out in a realistic manner. Using a dry paintbrush, use a small amount of red petal dust to brush the edges of the rose. I also used a little green between the petals and in the flower centers. Apply this dust while the flowers are still soft and pliable. 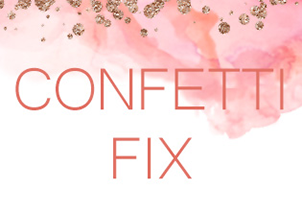 Applying the dust when the petals are set will result in a chalky non-realistic effect. Don't worry too much about the roses being identical to each other. It's okay for each to have their own personality (I prefer it that way). 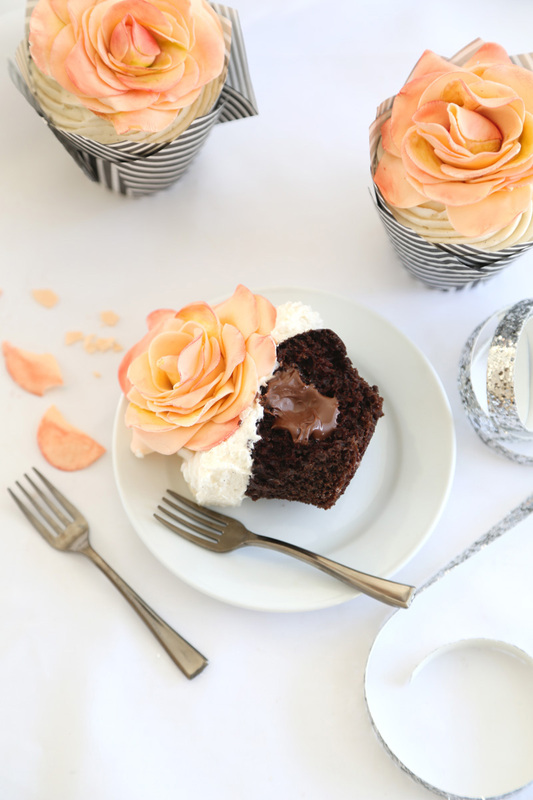 Even if you don't make the sugar roses for these cupcakes, they are absolutely delicious and a chocolate lover's dream come true. The centers are filled with rich chocolate ganache and the vanilla bean frosting swirl on top is a nice counter to all the chocolate. The recipe makes two dozen cupcakes, so you can keep one dozen and gift another (if you're feeling generous). Learning a new skill is exciting, and if you take the plunge into sugar flower-making, then be patient with yourself. The first flower may take a little longer to make than the rest, but that's just a part of the learning process. 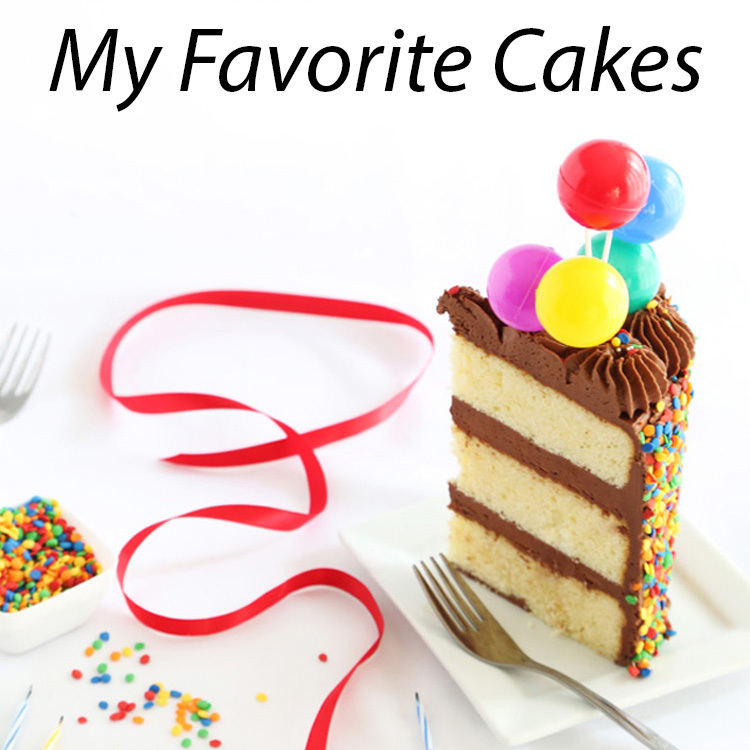 I’m a lover of buttercream and the recipe provided allows for a generous amount atop 24 cupcakes. Halve the recipe if you prefer less frosting per cupcake. Make the cupcakes: Preheat oven to 350 degrees. Line muffin tin with cupcake papers and set aside. Divide batter among muffin cups, filling each half full. Bake for 15-20 minutes. Let cool completely before filling and frosting. Make the ganache filling: Chop the chocolate finely and place it in a medium bowl. Pour the hot cream over the chocolate and gently whisk until the chocolate is melted and the mixture is smooth. Allow to cool until just warm and slightly thickened. Fill the cupcakes: Cut a divot in the centers each cupcake using a serrated knife. Using a spoon, place about 2 teaspoons ganache (or more to your liking) in the centers of each cupcake. Make the buttercream frosting: In a stand mixer fitted with the whisk attachment, mix together the butter and confectioners’ sugar. Begin on low speed until crumbly, and then increase to high and beat for 3 minutes until the mixture lightens. Add vanilla bean and beat again for another minute. If you find the buttercream is too stiff, you may add milk or heavy cream 1 tablespoon at a time until the mixture is spreading consistency. Beat until light and fluffy. Transfer the frosting to a piping bag and pipe the frosting onto the cupcakes, or spread the frosting on with an offset spatula. Store cupcakes in an airtight container, or well covered with plastic wrap at room temperature. I thought the roses were real! It wasn't until I scrolled down through the post and I saw how you made them! Amazing! So, impressive! I would like to attempt it, but I have always struggled with 3d art more of a 2d gal! And who doesn't love a chocolate cupcake! You're the sweetest, Kisha. I SO appreciate your kindness! Gorgeous cupcakes, They look way to pretty to eat! Those roses look real. You are an artist. Beautiful! Well, these look AMAZING. I love roses and also chocolate cake, but who doesn't? SO BEAUTIFUL!!!! I couldn't believe the roses weren't real. I can't wait to try making my own flowers...thanks SO much! These roses,look sooo real!!!! Fantastic job as always, love your blog!!! Heather, these are lovely beyond compare. I am in awe of your decorating skills! Incredible! You are a true artist. Oh waow! Those are the prettiest roses ever! So delicate! What an artist you are Heather! Any recommended tricks for keeping the roses? I'm thinking making the roses on a day off but making the cupcakes fresh the day of serving. Or should I do the other way around? Advice? Hi Anonymous! I'd definitely make the roses first. I enjoy crisp candy-like roses, so I store them at room temp. in cupcake liners on a baking tray placed on a pantry shelf. You can make them more than a week ahead of time. Rose-topped cupcakes stored in a an airtight container (like a cupcake-keeper) will become soft. My advice is make the roses ahead of time, bake the cupcakes fresh, and then frost and top with roses a couple of hours or so before presenting. Thanks for your questions! I love your blog. 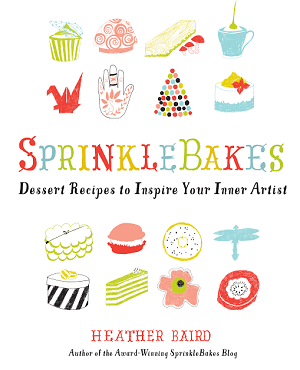 Each time I see a new email from Sprinkle Bakes it warms my heart. The beauty, skill, thought, time, that goes into your baked goods is beyond measure. I immediately forward the email to my 24yrold daughter who does not bake but appreciates pretty & yummy things. I will ask her about the email & we both smile nod & say oh so lovely. Last of all we love your puggies. We have two nice guys that make us so happy. One is getting old, the other is just a pudgy peach. Spring is around the corner.Thank you for making us smile. Hugs to the pugs. Thanks for the sweet words Jennie. I have an old guy too. Hugs to your furbabies, too! Thank you for such a detailed tutorial. Maybe someday I could be this accomplished, lol, I doubt it but the wonderful tips you share are do helpful. Hi Heather, those roses look so real, I can't wait to try making some myself! Does adding shortening to the fondant make it greasy at all? You'd think it would make them greasy, but it improves the texture of sticky fondant. It gets completely absorbed into the mixed pastes. It works beautifully for me. If you're not sure about using it, I suggest incorporating a little shortening in a 1 oz piece to see how it works. I think you'll be pleasantly surprised. Thanks for your question! Hi! 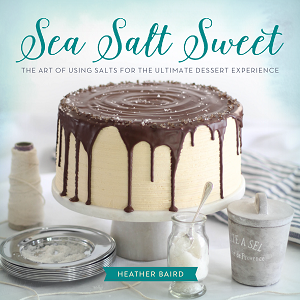 This is Heather by the way (I think you have may my blog mixed up with Rosie of Sweetapolita's blog - happens a lot!). The base of the flowers can get quite thick. You can squeeze the thick base of the rose together and trim away the excess with a knife. The pressure also causes the petals to fan out a bit, which makes it easier to separate them. I will add this to my directions. Thank you for your question! This is Natalie (Anonymous that posted on March 5, 2016). Firstly, let me apologise for getting you confused with Rosie, how embarrassing! I follow both blogs and have books from the both of you, and I was reading from both books before posting this message. 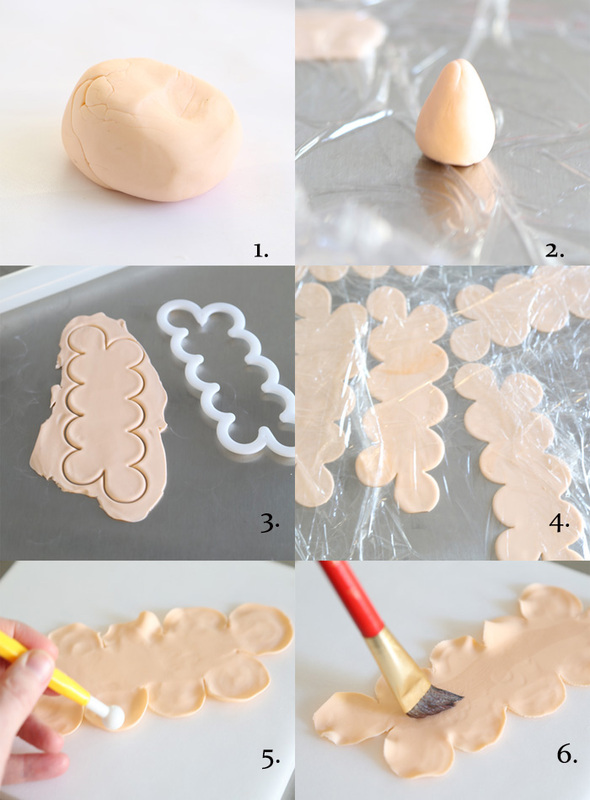 Secondly, thank you for posting this tutorial with this particular cutter. I purchased mine in late January, and the tutorial came at the perfect time and is so detailed with all the steps that I felt confident enough that I could pull it off. I have never made fondant flowers so this was my first attempt. No problem! Please don't be embarrassed! I'm so happy to see you commenting here. Your feedback is very valuable to me (and others, too!). I'm glad you found the tutorial useful, but I'm hoping to provide a how-to video soon so there's nothing left to question. Even though my tutorials are wordy and lengthy, I still feel like there are little tidbits of info that get left out. The flower formers are great, and most are inexpensive. If you're looking to continue your work in sugar flower-making then I'd suggest getting some. The cupcake liners could be trimmed shorter in a pinch.